The "before & after" photos below show Crown Butte in 2007 before the major forest fires, and then again in 2012 just after the major forest fires that swept through. The photo above was taken in 2016, showing some regrowth of the plant life around the summit. 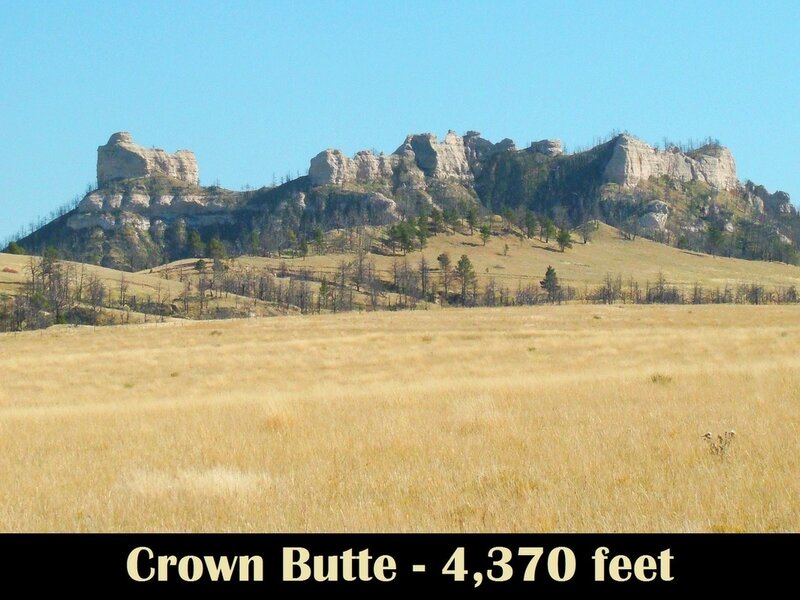 Before the massive fires of 2012, reaching the Crown Butte summit through the Ponderosa Wildlife Management Area in Dawes County may well have been the "epic" combination hike & climb on public land in Nebraska. To successfully reach this goal, a hiker/climber would have to be physically fit enough for at least ten miles of hiking and climbing through some of the most rugged terrain in the state. It would also require the ability to read topographical maps and use a compass well, because several miles of bushwhacking are required, after first hiking the Rim of The World Trail and then the Rattlesnake Trail. Excellent scrambling skills would be needed to make the final climb to the summit of Crown Butte. There has been a summit logbook in a small "cubbyhole" in the rock at the top. In time, the area will heal enough to present a chance to try this epic hike & climb. The summit logbook has some gaps of years between signatures, attesting to the difficulty of this epic hike & Climb. There is no way a novice should try this hike/climb on their own. There are mountain lions in this area, which so far have chosen to leave human visitors alone. We HIGHLY recommend this expedition be done as a small group of good hiker-climbers. Visiting beforehand with the staff at the Ponderosa office is important, so that you can get the latest updates on any restrictions, alerts or WMA changes. It would be good to call ahead to discuss your plans. They can be reached at: (308) 665-2924.